Dominator has opened up about its flagship project, the 38 metre Kalliente II, which will be built for a repeat client and launched in 2019. The yard celebrated the launch of the 28 metre Kalliente earlier this year, however a sudden change in the owner’s personal situation has led to an opportunity to upgrade. As a result, Kalliente has been put up for sale with bluewater and a larger sister will be built to replace her. Owner Terry Giles explains that he recently sold his European business and plans to personally oversee the reconstruction of his Houston residence, which was significantly damaged during Hurricane Harvey. This work will take 18-24 months, giving the Dominator team an ideal window in which to build a larger yacht. In an open letter, Giles added: "We loved the Ilumen so much that we realised we want to make yachting a bigger part of our life. We are working now on the plans for this special model that Dominator is designing to fit our unique needs, which includes being equipped for US waters." 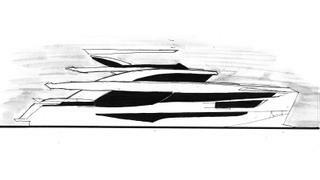 Full details of Kalliente II are yet to be disclosed, but Dominator has released this preliminary sketch (above), which reveals that she will be a tri-deck design with forward-raked wheelhouse windows and a wave-piercing bow. Meanwhile, the larger superyacht sundeck will be shaded by an extended bimini. Other features are expected to be announced in the coming months — this new order ensures that the yard will continue to grab headlines well into 2018.